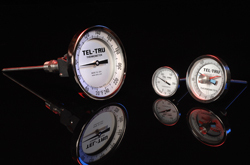 Tel-Tru Surface Thermometers are designed to measure surface temperatures on a wide variety of surfaces and are available in several configurations. Dual Magnet Thermometers: Specifically designed to be used on horizontal or ferrous non-horizontal surfaces. Tab Thermometers: Designed with two tabs with pre-drilled holes for screws. Clip-on Pipe Thermometers: Used for temperature measurement on pipes or tubes. 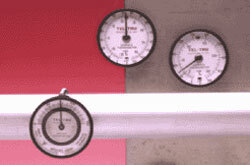 Spring Held Pipe Thermometers: Ideal for measuring surface temperatures of pipes, cylinders, and spindles.